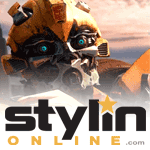 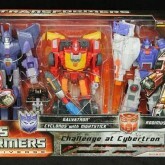 Cyclonus (Challenge at Cybertron) toy information. 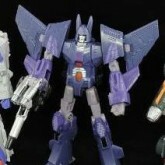 This version of Cyclonus, sporting colors inspired by his appearance as Hot Rod in the 1980s TV series, was sold as a part of the Challenge at Cybertron three pack with Rodimus and Galvatron. 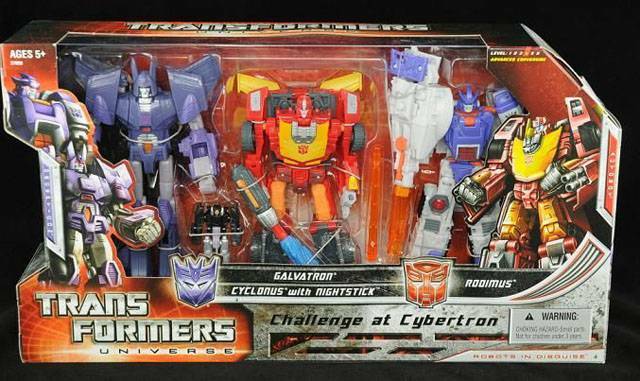 It was available exclusively as a raffle prize at Auto Assembly 2010 in the UK, and at the Animation-Comic-Game Hong Kong (ACGHK) material-entertainment fair held on 30th July to 3rd August, 2010 in Hong Kong. 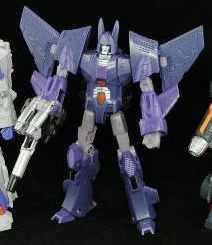 Cyclonus (Challenge at Cybertron) parts information.